Two years ago, a good friend gave me this amazing cook book as my birthday gift. Polpo (the book) is not only a beautiful edited cook book but precious object itself. And the recipes you’ll find inside are really cool and easy to make! Lately I’ve been working a lot with it… trying some new things, adapting some recipes from it or just getting new ideas to try out. Among those… I’ve been wanting to try and master some easy and delicious pizza recipes. After a few trials I managed to get a pretty good dough (it’s not easy a the beginning, and if you screw up a few times, just keep trying!) that you can transform into delicious pizza with very few ingredients. So the next time you think about ordering in some crap domino’s … check your cupboard & fridge first… as chances are you already have everything you need to work this beauty up ! 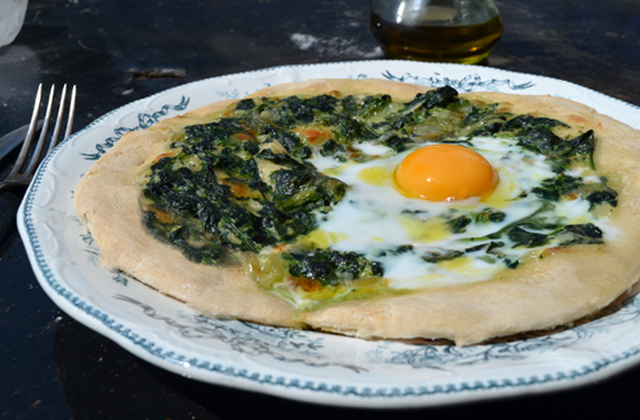 I won’t lie, the dough part is a bit annoying, but Raffaella Carra is here to help. When you attack it, just put Rumore on shuffle precisely 3 times, dance to it, and before you know it you will be done! There are two steps for this recipe, first you need to get your pizza dough ready, which can take a bit of time. But once it’s ready… you can be licking your fingers in less than 20 minutes. To get the dough ready, you need to start by mixing together the flour, salt, dried yeast, olive oil and tepid water into a ball. From now on you will be working on a floured (no excess) surface. Now what you are looking for is to push the dough backwards and forwards simultaneously to stretch it and then put it together into a ball again. Keep doing this for 10 minutes without breaking the dough.. and yeah.. it’s a little work out for your arms ! Now cover the dough with an oiled clingfilm and leave it to rise somewhere warm. After 30 minutes – at the very least – the dough is ready and will provide about 2-3 medium pizzas depending on your idea of medium. If you don’t want to bake them all you can always keep them in the fridge covered with a damp cloth for up to 12h. Before using them again, remember to take them out at least 30 minutes before. Once you are ready to attack preheat your oven to 250°. Start by blanching the spinach (boiling salted water) for one minute. It reduces a lot in volume so be generous. Plunge it directly into ice water to prevent it from overcooking and once it’s cold squeeze it to get all the water out of them. Chop them nicely then add the crème fraîche, the garlic clove pressed and 1/2 the parmesan. Add some salt and pepper and there you go it’s ready. Now we need to get the dough into the proper shape. We are looking for something like 20cm in diameter. 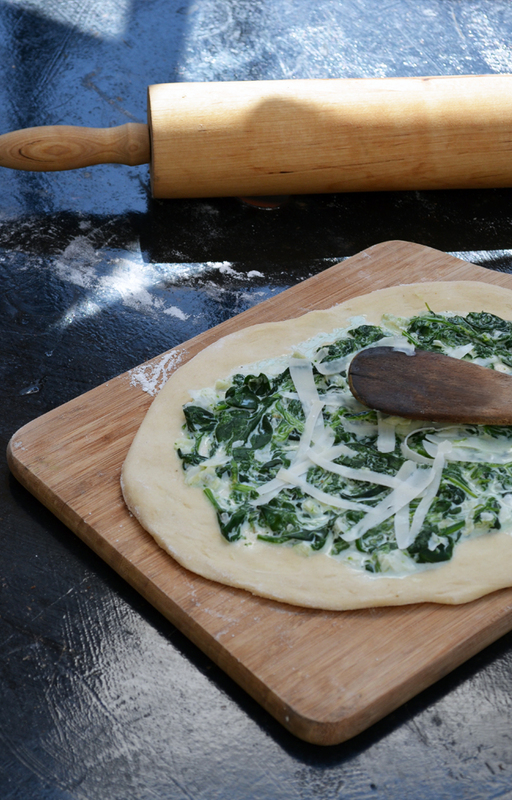 Just use a pastry roll (or a clean class bottle) and then spread the topping evenly making sure that the dough is a bit higher on the edges… it’s as if you were creating a spinach pool. Crack the egg on top of it and bake (I recommend placing it under baking paper) for 6-8 minutes. Just before it’s ready, add some grated parmesan and a dash of olive oil. Be careful as a few extra minutes can change everything as you are looking to get a runny egg when served. Now go somewhere sunny and have fun ! If you are French you get to say “ah…on est bien là!”.